Vino Las Vegas LLC is very involved in the Food and Wine industry in Las Vegas and we are always willing to jump in and help with a event for a good cause. Join us at the Venetian Resort and Casino and we join the New Vista Community kicking off their Wine Walk Season with a big party! This March New Vista Community will host their first annual Season Kick Off – Wine Walk – the BIG ONE! The Venetian Foundation, DeLuca Liquor & Wines, and Lee’s Discount Liquor have joined together to host this fundraising event to benefit the programs of New Vista Community. The event will be hosted in the Venetian ballrooms on Saturday, March 15th, 2008 from 3:00pm to 7:00pm. Guests will be able to sample wines from over 75 wineries while enjoying live entertainment, silent auctions, and appetizers. General admission attendees will pay only $50 while “Around the World” VIP’s will pay slightly more, $125, to have VIP access into the Around the World private room. The Around the World VIP Room will offer VIP’s choice wines from countries all over the world. VIP guests will also be able to participate in free table games to compete for prizes, enjoy hot appetizers paired with the wines, and will also be able to participate in the general admission area as well. To purchase tickets you can go online to http://www.newvistacommunity.org/ or go to any Lee’s Discount Liquor Store in Las Vegas or call 702-457-4677. All proceeds go to New Vista Community. At the door tickets will be $75 for general admission and $150 for VIP. This event is brought to you by these sponsors for the benefit of New Vista Community; The Venetian Foundation, DeLuca Liquor & Wines, Lee’s Discount Liquor, CW & MYLVTV, 97.1 The Point, Las Vegas Life Magazine, and Clear Channel Outdoor. This event benefits New Vista Community a local charity committed to providing equal opportunities and support to intellectually challenged people of all ages so that they may experience life to the fullest. New Vista Community has been in the Las Vegas Community for over 20 years and provides homes, respite care, in-home services to families with intellectually challenged members, recreational activities and life skills training. For more information on New Vista Community go to http://www.newvistacommunity.org/ or call 702-457-4677.
freshly sliced prosciutto with fig. That was followed up with vodka infused Penne that melted in our mouth. us with chocolate cake coverd with pistachio sauce that was well worth the 25 min wait. something for every price range and taste. Proprietors / Chefs Giovanni and Marcello Maura really have a hit with Nora's located in Boca Park in Summerlin. Their Food and Wine staff is very knowlegeable and we know we will be hearing more from this restaurant in the future. We have received alot of feedback from our readers, customers, and many others in the Food and Wine Industry all over the world. Vino Las Vegas has added video interviews with winemakers and restaurant reviews. There is much more to come. We have added a YOUTUBE website to make it easier to watch and download all of the Vino Las Vegas videos from one location. You can access our video page at http://www.youtube.com/VinoLasVegas. There are many plans for Vino Las Vegas in 2008 from dinners, classes and meet the winemaker weekends coming up soon. Ecluse Winemaker and Proprietors Steve and Pam Lock were in Las Vegas to host a dinner at the Le Cordon Bleu Culinary Institute in Summerlin. After the event, Steve Lock spoke with Scott of Vino Las Vegas about Ecluse wines , their roots, and future plans. Ecluse is locted on 30 acres in Paso Robles and produce some of Paso Robles most sought after grapes. They produce limited production, handcrafted wines. We had the opportunity to taste their 2005 Ecluse Syrah , the 2005 Ecluse Cabernet Sauvignon , the 2005 "Rendition" a blend of Syrah, Grenache and Mourvedre, the 2005 Zinfandel which only 167 cases were made and our favorate the 2005 Ecluse "Ensemble" a blend of Cabernet Sauvignon, Petit Verdot, Merlot and Cabnernet Franc. The Las Vegas Chapter of the American Wine Society and Vino Las Vegas had a Winemaker dinner at Cafe Bleu the student run restaurant Le Cordon Bleu Culinary Institute in Summerlin. Proprietors of Ecluse Wines in Paso Robles. forward to for quite a while. Spiced Zinfandel Poach Pear Tart, Orange Mascarpone Cheese. We have attended many wine events at Cafe Bleu . The food and service has always been excellent. This event however was the best we have attended. The menu was pared perfectly with these very special limited production wines from Ecluse. Winemaker Steve Lock has made some award winning wines and we enjoyed all of them. Marche Bacchus and to say the least, we got quite a wine education. He is unlike any winemaker we have met in the past. We enjoyed his 2006 Red Zeppelin Chardonnay Paso Robles and the 2005 Red Zeppelin Black Zeppelin Paso Robles Syrah as we learned more about this very articulate, intelligent winemaker. With this impressive list of awards Stillman has made a reputation for himself as one of the country's premier Syrah wine makers. Stillman spoke to us about his La Mort Du Roi Paso Robles 2005. Which is now sold out . We were fortunate enough to have enjoyed a bottle of this very unique Syrah. It is blended with Alicante Bouchet wich is a crossing between Grenache and Petit Bouchet. By itself this grape produces wine that are unexciting but when blended adds additional color and texture to wines. Stillman added 18% of this varietal to the La Mort Du Roi Syrah and produced Syrah with color that is unmatched with a nose and palate to go with it. This is one of our favorite wines we have had in a while and are very anxious to see its cousin Black Zeppelin pick up where the La Mort Du Roi left off. Canyon Club at the Four Queens. The guests were treated with the great sounds of two fantastic artists performing together. Michael Soli and Rick Duarte provided the guests with an unforgettable night. The wines are continuing to get better with each event that Vino Las Vegas attends. The tasting lounge was our first stop where we spent some time with Award Winning Winemaker Stillman Brown of Red Zeppelin wines. He treated us to his Red Zeppelin Vindication 2004 which was one of the best of the night as well as his Zeppelin La Mort Du Roi 2004 which scored 92 points . Dr Loosen was also in the tasting lounge with the Graacher Himmelrich Resling Kabinett 2006 and Wehlener Sonnenuhr Spatlese Resling 2006. Henry LaGarde was also present and pouring the LaGarde Syrah Reserve 2005. We had the opportunity to speak with Mitchell Preston sales manager for Rodney Strong Vineyards. We enjoyed all 5 of his wines but the Alexander Valley Cabernet Sauvingnon 2004 really stood out from the rest. Other wineries present near the stage were Michael David Vineyards, Precept brands , Peter Franus and of course the Rock n Roll wines pouring the Rock n Roll wine " The Grotto" Shriaz. This was another hit for Chris and his partners finding this great venue with talented artists providing the stage for some great wines. Good job to Chris and all of the Rock N Roll staff for a great job. Spanish wines are always a treat for us. We heard Joseph and Bibiana from Vin Sauvage were at Bleu Gourmet pouring their latest from Spain so we had to stop by. Our favorite of the night is what Joseph called his "rock star" wine and he was right. The AALTO Ribera del Duero 2004 from Spain was magnificent. In the glass is was purple/black and medium bodied. On the nose aromas of smoke, toast , vanilla , and blueberry/blackberry jam. The nose was outstanding and continued on the palate with the fruit and smoke giving it excellent depth and tannins. Wine Spectator scored this limited production wine ( 450 cases ) 94 points. We loved this wine from the nose to finish. In our opinion this 100 % Tempranillo will better over the next 6-8 years. The Ribera de Duero is a comparatively new DO. It spreads in a narrow band along both banks of the Duero and produces some of the greatest red wines of Spain. Bordeaux grape varieties as well as the local Tinto de Pais and Garnacha are extensively planted. The top brand of the vineyard, Vega Sicilia (it's 'Unico'), is reputedly the most expensive wine in Spain. We are always looking for a great bottle of Champagne and we found one at Marche Bacchus. We stopped to enjoy their new Sunday brunch and to welcome Nathan back from serving our country in Irag. We were looking for something special and decided on the Heidesieck & Co Champagne Brut. Owner Jeff Wyatt saw me pick out the bottle and said " that is a great choice. It was in the Top 100 "
This Champagne is a Blend of 70 % Pinot Noir 20 % Chardonnay10 % Pinot Meunier. In the glass the appearance was light yellow color, with green highlights. On the nose it appeared slightly woody and spicy. The palate was very fruit forward and well-structured. The origins of Heidsieck & Co Monopole go back to the 18th century. Following in the footsteps of Florens-Louis Heidsieck, his nephew Henri-Louis Walbaum and brother-in-law Auguste Heidsieck created one of the most sought after champagnes ever. In 1895, the firm already shipped over 1,5 million bottles worldwide.In 1818, Heidsieck & Co Monopole was appointed suppliers of champagne to the king of Prussia, emperor of Germany; in 1911, it was appointed suppliers of champagne to the English court.In 1933, Heidsieck & Co Monopole champagnes features at the Swedish court and at the table of Csar Nicolas II (the latter ordered over 400 000 bottles a year for his personal use). and Lindsay on a few occasions. On this visit , Jim sat down with Elaine and spoke about the vineyard and the newest members of the Stanley Lambert family. We also tasted the new additions and were pleasantly surprised. The Nordic Frost Dry Resling was very fruit forward and refreshing. In our opinion , this will be a big hit for them. The Thousand Words Chardonnay was very nice as well. Very light bodied and fruit forward. Next up on our list was Three's Company GSM. This is was a nicely blended Aussie wine that will do very well in the US as well as Australia. We are big fans of Stanley Lambert's Family Tree Shriaz so we had to try the Silent Partner Cabernet Sauvignon. This wine is every bit as good as its high end Aussie cousin. We also found out that one of our favorite Stanley Lambert wines Throughbred Cabernet Sauvignon 2004 recently scored 90 points from Wine Enthusiast ! Great Job to the entire Stanley Lambert Family for their new releases and the score from Wine Enthusiast . We stopped by Marche Bacchus to interview owner Jeff Wyatt and decided to stay for lunch and a blind wine provided by Jeff. Tex and Gidget joined us and as usual Jeff gave us a big challenge. He decanted the wine and poured for us without any hints. In the glass this wine showed medium bodied and red-purple in color. On the nose hints of musk and barnyard suggested it may be old world. The palate when first sampled gave us hints of cassis and dark fruit with low tannins. Many of us decided it could be Italian IGT of the 2004 vintage. As the wine opened up some of us reported hints of chocolate and more tannins. We were now thinking it was a Bordeaux blend Cabernet Savingnon and Merlot. One member of our group suggested it could be a Cabernet from Napa Valley. A couple of our group went back to their original suggestion It was Italian IGT 2004 vintage. Jeff reviled the bottle to us as Grilli del Testamatta I.G.T. Toscana rosso 2005 . It was a blend of Sangiovese 75%, Colorino 15% and Canaiolo 10%. Congratulations to the two people in our little group that stuck to their original decision on this wine. Earlier in the day we sat down with owner Jeff Wyatt as he explained some real high tech wine tasting that lets us enjoy some wines that we may not be able to afford by the bottle. Jeff explains how this works in the video above. Marc's has been around in the same location for quite a while and has earned accolades from City Life and Zagat. We dined at Marc's almost 2 years ago so we were way over due for a visit. We enjoyed speaking with Chef Marc on our first visit and the food was good . We were looking forward to a repeat performance. We made a last minuet reservation and were promptly seated with no wait. The hostess was friendly and professional. Unfortunately that was the last of the professionalism we would see. The wine list was small but adequate and we settled for a Tobin James "Rock N Roll" Syrah 2005 Paso Robles. Our next task was to get someone to bring it to us ! Our "first" waiter of the night came by as we were looking at the wine list and I asked him to come back around in a couple of mins. That turned into at least 10 mins when our "second" waiter noticed we were waiting with the wine list opened. I gave him our selection and he said he would return with our choice. Another 10 mins went by when waiter "one" finally came back and asked us if someone had helped us. I said yes ! Then he disappeared without taking our Food order. 10 mins went by when I "flagged" down waiter "one " and told him we were waiting for our wine selection. I explained it was the Tobin James and he left once again, STILL without taking our Food order. Waiter "one " returned with the proper bottle and I told him that Elaine will do the "honors" in tasting the wine as we normally do. He opened the bottle improperly, leaving foil on the lip of the bottle , smelled the cork and placed it in front of me. Then he proceeded to pour the taste for me and not for Elaine ! We shrugged that off and ordered our Food. The wine was very nice as we expected. Waiter " three" peaked around the corner of our booth and was surprised that we had received our bottle ! We can only guess that he was maybe their version of a Sommelier. We never spoke to him at all. ! The Food was good but not what we expected. Overall we were disappointed with the service. Our entree of Chicken Florentine was unique. It was wrapped in prosciutto then covered with spinach with a white cream sauce. The Cesar salad was very large and enough for two. Marc's has been around for a long time and we hope they can work out whatever service problems they have if we should ever decide to return. Vino Las Vegas ON THE AIR ! We are very happy to announce that Vino Las Vegas is on the Air as a podcast. Every Saturday morning 9am Pacific / 12pm Eastern. We have done about six episodes and the feed back has been very positive thus far. You can link to our podcast using the link on the right side of the blog and listen in. If you log in during that time we can talk live or you can download the episode as a podcast and listen at your convenience. The broadcast is listener and email driven. No topic is really off limits in regard to Food and Wine. 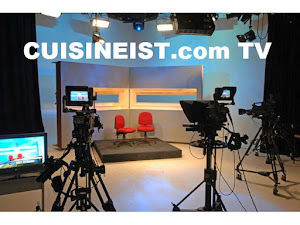 Our most recent broadcast was a report on Food and Wine in South Florida. We have many events and trips planned for 2008. Many of which you are welcome to join us. For those who are unable we plan to do live videos broadcasts at these events and place them on the Vino Las Vegas Website at www.vinolasvegasllc.com and right here as well. Keep those emails and calls coming and lets have some fun in 2008. The single most influence on how we got envolved in wine to the extent we have is the American Wine Society. The American Wine Society is a National organization that " promotes the appreciation of wine through Education. You can find a chapter near many cities and in almost every state. The Las Vegas Chapter meets once a month at the Lee's Discount Liquor near Lake Meade and Tenaya way. Very often a winemaker or a representative from a vineyard attend the meeting and educate the chapter about their wine and vineyard. The Chapter also has educational seminars from winemakeing , "blind tastings", and the Annual National Tasting project. In addition to these educational events, the Chapter hosts many winemaker dinners and Chapter outings like picnics and jazz concerts throughout the year. We here at Vino Las Vegas are excited to announce The Vino Las Vegas Newsletter is now available. Many of you have asked for such and product and it is available to you 4 times a year via U.S Mail or Email. It contains a vast amount of information that you have asked for including detailed wine and restaurant reviews, contributing authors and interviews with Chefs, Winemakers and other "movers and shakers" in the Food and Wine Industry not only in Las Vegas but around the world. The Chateau Ramafort Medoc 2000 was a wine we found by accident. We were at Roys Fine Wines in Ft Pierce Florida looking over their vast selection of wines when we saw this bottle on the shelf. This was the only bottle in stock and when we saw the vintage it was an easy decision to bring this one home for the price. The Medoc is Bordeaux's largest and best know wine region located on a slice of land northwest of Bordeaux . Its gravel plains, occupying the west bank of the brown, island-spotted estuary, rarely swell into anything resembling a hill. However, this poor soil is ideal for viticulture – vines root more deeply if they don't find the sustenance they need in the topsoil and, firmly rooted, they are less subject to drought and flooding. The region's eight appellations produce only red wines, from the grape varieties of Cabernet Sauvignon, Cabernet Franc, Merlot and, to a lesser degree, Petit Verdot. Cabernet Sauvignon gives body, bouquet, colour and maturing potential to the wine, while Merlot gives it its "animal" quality, making it rounder and softer. The D2 wine road, heading off the N15 from Bordeaux, passes through Margaux, St-Julien, Pauillac and St-Estèphe. In the glass the color was dark red and medium bodied. On the nose aromas of earth, musk and oak come through with some dark fruit at the end. After opening for over 30 mins the nose had much more dark fruit and the palate had hints of cassis and dark fruit with medium tannins on the finish. Further research of this wine showed it to be a blend 50% Cabernet Sauvignon and 50 % Merlot. This was a terrific bottle of wine and our only regret was it was the only bottle they had. We are back , rejuvenated and excited about plans for Vino Las Vegas in 2008. The trip to Florida was educational and informative in relation to the food and wine industry. We had the opportunity to dine in some world class venues, drink some fantastic wines and even managed to attend a couple wine events as we traveled up and down the east coast of Florida. We at Vino Las Vegas hope you all had a safe Holiday and a Happy New Year and look forward to a rewarding, prosperous and fun 2008. Miami Wine Events with Barry Alberts of Berries to Wine Inc. Whenever we travel we always check the newspaper for any wine events nearby. This time we were very fortunate to attend two events both hosted by Barry Alberts of Berries to Wine Inc. and assisted by Patrick Sullivan, Wine and Spirts Editor of Dine Magazine. The first event we attend was at a South American restaurant in Coconut Grove that featured about 8 South Amercian wines some of which there were only a couple bottles in the country. Patrick Sullivan did a great job pouring and speaking about these wines. Wine Consultant Barry Alberts invited us to attend his "big" event the next night at Christabelle's Quarter. The restaurant took 4 years and 12 million dollars in the making . This was an event we could not turn down. Upon entering the restaurant you notice flood marks on the giant wood entrance doors. Barry explained that these doors, original gas lamps and other fixtures came from New Orleans after Katrina. As we walked up the three floors via a marble staircase we could not help but marvel at the stained glass and architecture of the restaurant. It was truly amazing. Once up to the third floor we stood out on the balcony as Barry treated us to 11 wines from Chardonnay to Pinot Noir and even a tawny port from all over the world. Barry has been doing wine events in Miami for over 16 years and he knows how to do it right. We will definitely spend our Thursday and Friday nights with Barry every time we are in town. For more information on Berries to Wine, Inc you can e-mail Barry at Calb150497@Aol.com. People have said for years sometimes the best things come in small packages and French Kiss Terrasse located in Miami's Coconut Grove fits this to a tee ! It was a pleasure to meet owners Marc Antoine and Joanne Gimenez. Marc is originally from Southern France and has worked in dining for over 20 years. He was born in Paris and was raised in Marseilles. 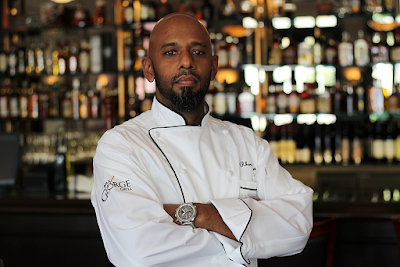 He attended chef school in France and arrived in Miami six years ago after a successful business in the island of Saint Marteen,W.I. Whenever we visit South Florida we try to stop by the Cellar Club at the historic Biltmore Hotel in Coral Gables. Last year we attended a Champagne Reception for Palm d Or Chef de Cuisine Philippe Ruiz in one of the Biltmore's beautiful ballrooms. On this visit we sat down with Yvonne Roberts Cellar Club Director as she told us about the Cellar Club, its beginings and future plans. In 1994, Yvonne was contracted by the hotel's General Manager, Dennis Doucette, to develop and launch a distinctive social club presenting specialty events for its members, with a focus on food and wine. The club has grown to over 3000 members of all ages and backgrounds. Members can enjoy over 100 wines by the glass and a very extensive wine list in the luxurious cellar club bar as well as many of the amenities the Biltmore has to offer. Yvonne has put together a very special club that hosts winemaker dinners, Interactive cooking lunches with renowned chefs as well as artist receptions and Yvonne told us this year the Cellar Club's annual Food and Wine weekend has been integrated with the Food Network South Beach Wine and Food Festival. Winemaker Mia Klein suggested we make a few stops if we were going to be in Vero Beach. Our first stop was The Tides fine dining restaurant. This restaurant was in a word, excellent. Chef –Owner Leanne Kelleher really has a hit with The Tides. Her vision of fine dinning with fresh local ingredients prepared through classical methods as well as her own special touch makes this a destination restaurant in Vero Beach. The mahi mahi and her macadamia nut encrusted snapper were prepared to perfection. Chef Leanne came to our table introduced herself and her “franchise waiter” Kenny. The service provided by Kenny was one of the best we have seen in a while. The Wine List has earned The Tides the Wine Spectator Award of Excellence for 2002, 2003, 2004, and 2005 Manager Matthew Moore has done a great job as well in the operation of the restaurant. The Tides has become very popular. Reservations are a must. To find out more about The Tides visit them at www. Tidesofvero.com.